Acquiring material things won’t buy you happiness. Yet when you invest your money into something with a higher purpose, the return on your investment is priceless. When you give from your heart, your generosity does come back to you. The joy and peace that arise from within is indescribable. You are in that energetic flow. Ashram Board Members know this, which is why have created a matching funds campaign. For every $1 you donate, the Ashram receives $2. Leading the way in our “Investing in Your Ashram” campaign, we have committed to matching your donations up to $22,000. Investing our energy by pledging matching funds enhances Svaroopa® Vidya Ashram’s capacity to serve you. This investment grows programs, essential support staff and improvements to Lokananda. This invigorated infrastructure is ready to spread more of Swami Nirmalananda’s teachings to you as well as more seekers. In other words, we are investing in YOU! We also understand that, as donors, we further our own spiritual development. Following the impulse toward generosity by making a financial contribution is the ancient yogic practice of dakshina. It is a way to support your teacher and the teachings. Like all of your Svaroopa® Sciences practices, what you gain is your own Self. You’ve heard that money can’t buy you happiness. In this case, I heartily disagree. By investing money in an organization dedicated to you knowing your own Self, you gain something valuable. 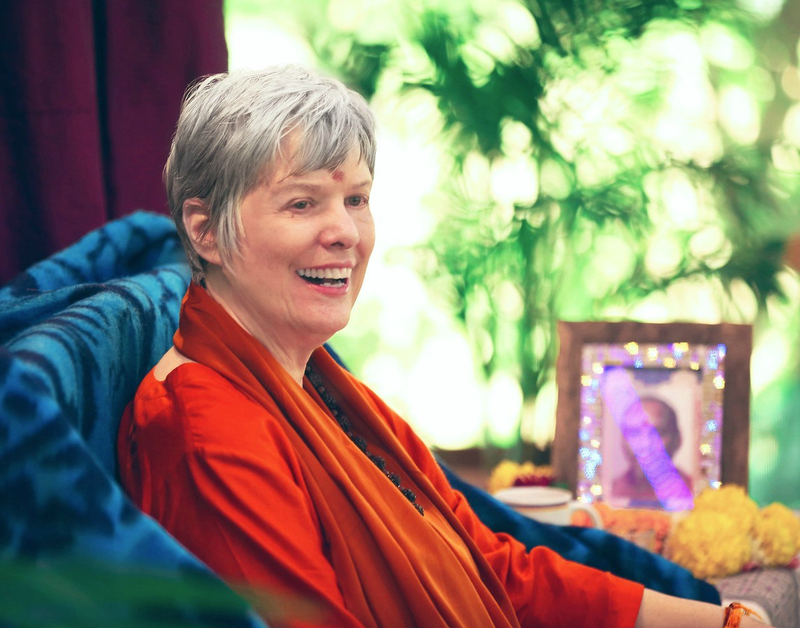 Over the next few weeks, you will read some very personal accounts from your Board members on what investing in the Ashram means to them, and what it does for them. We have challenged ourselves to create the matching funds donation. Now we challenge you, the Svaroopa® community, to equal our generosity. Invest in your Ashram, thus invest in your Self. Remember, for every $1 you donate, the Ashram receives $2. Click here to read more about Investing in Your Ashram. Click here to get your donation doubled. This entry was posted in Ashram News on April 24, 2018 by Svaroopa Vidya Ashram. In the article’s words, I wish I could say that I’ve completely stopped “dragging myself down.” Still, I am making progress! Patanjali’s yamas (lifestyle practices) do now “blossom spontaneously” for me. I don’t have to practice as many mental reminders to refrain from negativity. I am organically less greedy, grabby and needy in my interactions with others, and more importantly, in my own inner actions and reactions. I also find myself more and more drawn to the niyamas, which focus on resolve, not restraint. The niyamas include shaucha, purity; santosha, contentment; tapas, tenacity; svadhyaaya, chanting/studying yoga’s ancient texts; and ishvara-pranidhana, surrender to God. I repeat mantra silently at various points daily. Yet, my mind needs more work. With many layers to clear, out loud mantra repetition (japa) is just the ticket. I was reminded of this recently. I’d slipped into churning about things either beyond my control or not worth worrying about. Two reliable sources advised japa periods of an hour or more. It worked, and sent me into another niyama — tapas. I’m “buckling down to do the hard stuff,” as the article says about tapas. For me it means doing more japa. Having cleaned out my actual closets, I’m trying to clean out more mental and emotional closets. By doing so, I’m trusting in the blossoming forth of more niyamas. I’m looking forward to deep contentment, and filling more of my life with study, song and surrender. In any season, deep cleaning lets in more light. Do more japa! This entry was posted in Ashram News on April 18, 2018 by Svaroopa Vidya Ashram. Witnessing the transformation of students through Svaroopa® yoga has motivated my teaching for over 20 years. I now teach seniors who have been with me for over a decade. Their dedication inspires me. Mostly, I teach for selfish reasons. Svaroopa® yoga changed my life. It taught me to be in charge of myself in a new way. Now I teach to share this with those open to receiving it. In private sessions and yoga therapy as well as in classes, my focus is on self-empowerment tools. Thus, Ujjayi breathing is usually the foundational practice for students and clients. When they begin to use Ujjayi every day, they often have tears of gratitude. I assure them, I’ve been there, I’ve done that. I know you can be helped. I make sure they know that it’s the yoga dissolving the pain, in mind and body, not me. I’m just doing my job. When people are in pain, friends and family usually don’t understand that they are burning up inside. This was my experience in my mid-thirties, living with excruciating pain. I felt helpless and so needy. Lying in bed, breathing, even wearing clothing — all caused pain. The common catchall diagnosis is fibromyalgia. From my mother and grandmother, I heard it’s “just aging. You learn to live with it. That’s what we all do.” Yet after my first “accidental” Svaroopa® yoga class, I was pain free for three days. So I began taking weekly classes. Even from the first, I knew I wanted to teach. As a teacher, I aim to convey that you get to choose, you get to make yourself a priority. As students allow healing from the yoga, they stop bending over backwards for friends and family. They no longer need to prove they are worthy of getting love. When they take charge of their own lives, they find the love they have been seeking outside is actually within. For many, especially those in pain, they first see yoga as an escape. When they notice they are living more pain free, I talk straightforwardly about taking their yoga more into active, day-to-day living. Teaching them Tadasana, I guide them to stand in the Truth of who you are, with eyes open and a soft gaze. This is how to take blissful steadiness into the world. As students begin to find the inner source of love and bring it into their lives, their relationships improve. Connections with family and friends become mutually loving. In the end, I teach because of this wonderful domino effect. It’s my way of contributing to the world. This spring, I took all three of the Half Day Programs offered by Vidyadevi Stillman when she was teaching in San Diego. With super-challenging poses she nudged us beyond where we thought we could go. This experience got me excited about the possibility of expanding my teaching to younger students. This entry was posted in Ashram News on April 10, 2018 by Svaroopa Vidya Ashram. Ashram “Deepen It Yourself” weekends are DIY with Grace. It occurs to me that were I to begin approaching my current bookshelf project from a place of “capital-S Self” rather than “small-s self,” the project would be easy, even with challenging individual steps. Blogging now about my Ashram DIY experience is a blessing, as it reminds me how I forget to allow Grace into my everyday life. Simply repeating mantra instantly brings me into Self. Then the chore of bookshelf assembly becomes filled with Grace. My experiences in the DIYs were filled with community, collaboration, connection and a deepening commitment to my own yoga practice. I learned from my own experience as well as from observing the experience of others in the group. I still remember and use a tweak Swamiji suggested for Lunge that profoundly changed the pose for me. And I particularly appreciate the take home set of poses we were given. Each of my three DIY programs gave me an ease-filled way to continue deep experiences in my personal practice. Perhaps best of all, DIY was fun! The schedule, while full, was relaxed in a way that Teacher Trainings are not. There was an ease to the group and its way of being. Moment-by-moment, my retreat experience was filled with Grace and transformation. Whatever your current approach to DIY projects, do yourself/Self a favor and experience our Ashram DIY Weekends – to deepen it yourself. This year I will be there again and look forward to seeing you too. This entry was posted in Ashram News on April 4, 2018 by Svaroopa Vidya Ashram.